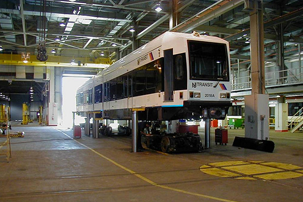 KINKISHARYO has a rich history of maintaining vehicles that we have designed and manufactured ourselves. When we take on a new transit project, we always aim to assemble the light rail vehicles on-site, investing in the local economy and supporting regional growth. “Kaizen” roughly translates to “continuous improvement in every respect.” Our comprehensive approach to vehicle maintenance implements the Kaizen principle that no matter how well you’re doing, you can always do better. We focus on improving the entire process, not just achieving certain results. We ensure continual improvement by applying innovation and analyzing all aspects of performance through management, engineering and quality perspectives. Our approach to Kaizen has earned accolades from Federal Transit Administration auditors and peer groups for performance far above transit industry standards.